On the following pages you will find the answers to many of your crochet and knitting questions, along with tips and general helpful information. To learn more about crochet and knitting, we encourage you to also invest in a reference book, take a class and join a local crochet or knitting guild or group. You will not find how to crochet or knit illustrations at this site. For basic how to crochet and knit diagrams, go to www.learntocrochet.com or www.learntoknit.com. In addition, check out "Helpful Web sites" for more downloadable diagrams and/or video clips. If you cannot find an answer to your specific questions, we suggest that you visit the Craft Yarn Council's bulletin board. Before posting your question, please use the search option. Type in one or two key words that explain your problem and hit the enter key. There may be many helpful posting that answer your specific question and you will not have to wait for an answer. If this is not successful, read through the introductory suggestions at bulletin board home page and then post your question. For questions about how to do specific crochet and knitting stitches, go to Helpful Resources and Web Sites. Whether you are a crocheter or knitter, checkout the helpful tips in this section. Click here. 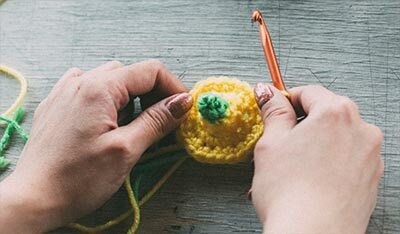 Crochet and knitting are two-handed crafts, which means you will use both your right and left hand to manipulate the yarn, needles or hooks. Learners who use either hand often find the first steps awkward, but with a little practice it gets easier. Learning knitting and crocheting in the traditional methods as right-handers learn avoids future problems and ambiguities with patterns and techniques. Left-handed knitters often times find it easier to learn to knit continental style. With the continental technique, which is taught in Europe, the yarn is held with the left hand rather than throwing the yarn over the needle with your right hand as is shown in U.S. instructions. 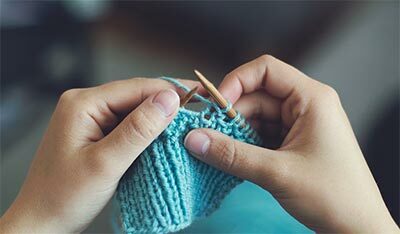 Left-handed crocheters, who have difficulty learning to crochet right-handed, should visit the Crochet Guild of America web site and click on left-hand instructions. Abbreviations are crochet and knitting shorthand. Click on the links below for an extensive list of the most commonly used abbreviations. Remember, publishers also will provide definitions for special abbreviations used in a pattern. A look at some of the newer yarns and how they are used. Click here. There are wonderful resources available online, in print and on CDs to help make your crochet and knitting experience more enjoyable. In addition, consider taking classes at your local yarn department or store or joining a guild.